Stores reference 22c/1301771. Size medium broad. 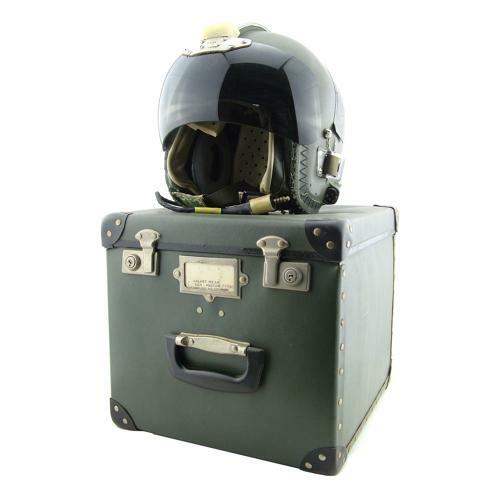 The MK.3A is a variant of the MK.2A helmet with the same avionics system but fitted with the MK.2 Anti-Glare visor (centre rail mounting) used on the MK.1A flying helmet. It was intended for use in fixed wing aircraft without ejector seats or provision for oxygen masks (the Mk.3B is same helmet but fitted with mask hooks for the type 'P' & 'Q' plus a modified version on the 'H'). The moulded glass fibre resinate shell is finished in olive drab green. The internal padding is beige leather with a green edging. The shell is in reasonable condition apart from the usual stress cracks, chips, small scrapes and scratches. Internally the helmet is good but the foam rubber backing on the lining parts is shedding as usual. Retains excellent gel filled ear capusles. Fitted with a standard short pigtail loom and NATO plug. The tinted acrylic visor has only minor scratching and is complete with cloth cover. The helmet comes with its original blue fibre storage case with foam rubber insert, both keys and fitting/maintenance instruction leaflet. The case is in good overall condition. Considerably rarer than the later 3C. Whilst it would benefit from a bit of clean up this is a good complete example and makes a super display piece. Stock code H22280.